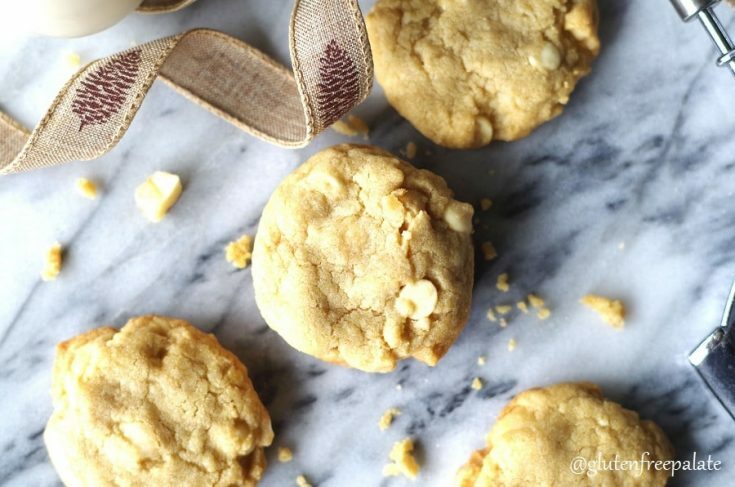 Crunchy, chewy, Gluten-Free White Chocolate Macadamia Cookies are a perfect treat any time of the year. These easy gluten-free macadamia cookies make great gifts that warm your loved ones from the inside out. Looking for more cookie recipes for the holidays? You might like my Grain-Free Strawberry Thumbprint Cookies. My Gluten-Free Oatmeal Chocolate Chip Cookies are equally scrumptious. 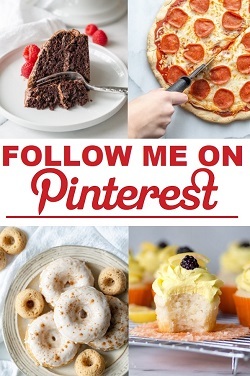 I’ve recently decided that I don’t have enough cookie recipes on the blog. I looked through all the amazing recipe I have, and there’s just not enough. You never really can have too many cookie recipes, right? 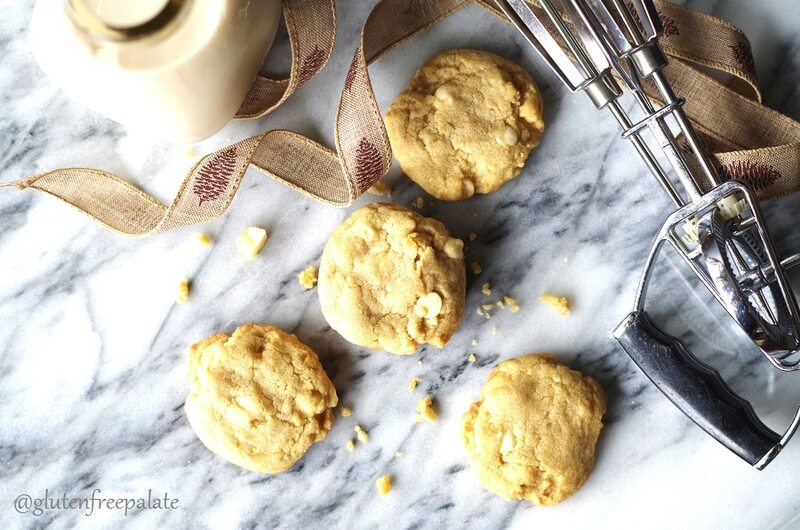 One of my very favorite recipes from my cookbook is my Gluten-Free White Chocolate Macadamia Cookies. They are chewy, crunchy, and soft all at the same time. Seriously. And they are the best. These gluten-free macadamia cookies are really simple to make and the addition of ground macadamias inside the cookies makes these gluten-free cookies chewy and delightful. 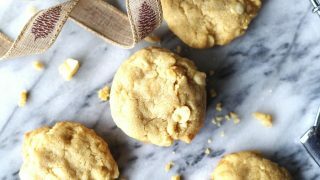 One of the things that makes these gluten-free white chocolate macadamia cookies the best is the combination of flavors. You have your buttery, vanilla-y cookie, white chocolate chips, and marshmallow like macadamias. Have you ever tried a raw macadamia nut? It melts in your mouth like a cloud of marshmallows. Although the macadamias in this recipe are toasted, they still have that marshmallow effect when enjoyed in this delicious cookie. When I bake these cookies I like to use good vanilla extract, and when I splurge, vanilla paste. Up until I started working Rodelle products, I hadn’t tried vanilla paste. Vanilla paste to me is the top-shelf version of vanilla. It’s concentrated and has a smooth, rich finish – almost like a fine bourbon or aged wine (but without the acidity). This list of gluten-free white chocolate chips may change. Always check labels before purchasing. Some of these may be processed in a facility that also processes wheat. Another thing that the Rodelle vanilla paste is amazing in (not related to cookies) is whipped cream! I can tell a huge difference in using the paste vs. vanilla extra in fresh made whipped cream. It gives it a sweeter, smoother flavor as opposed to the vanilla extract. I discovered it by accident one day when I reached for the paste instead of the extract and I haven’t gone back since. Preheat oven and line two cookie sheets with parchment paper; set aside. Chop ½ cup of macadamia nuts and set aside. Melt 2 tablespoons of the butter. In a food processor, combine melted butter and remaining macadamia nuts. Process until the mixture forms a lumpy paste. Set aside. In a medium bowl, cream the remaining six tablespoons of butter. Beat in sugars, egg and vanilla. Continue to beat until light and fluffy. Beat in the macadamia nut paste. In a separate medium mixing bowl, combine the chopped macadamia nuts, flour, baking soda and salt. Add flour mixture to wet mixture and mix until combined. Drop by rounded tablespoonfuls, two inches apart, onto the cookie sheet. Bake for 10–12 minutes, rotating the pans halfway through for even baking, until the cookies are light brown and slightly firm to the touch. Remove from the oven and let cool on the cookie sheet for 2–3 minutes. Finish cooling on a wire rack. Store cookies in an airtight container. For the full list of ingredients and directions see the recipe card below. 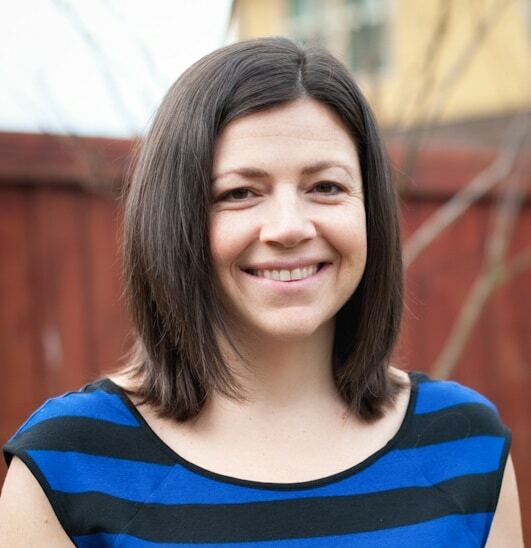 If you have any questions about substitutions, please leave a comment below and I will get back to you. If you are looking for a cookie that travels well this is the gluten-free macadamia cookie for you. Gluten-Free White Chocolate Macadamia cookies also make great gifts, and are the perfect treat for Santa. Texan Erin Baking has a roundup of 20 amazing Gluten-Free Cookies that you are sure to love. 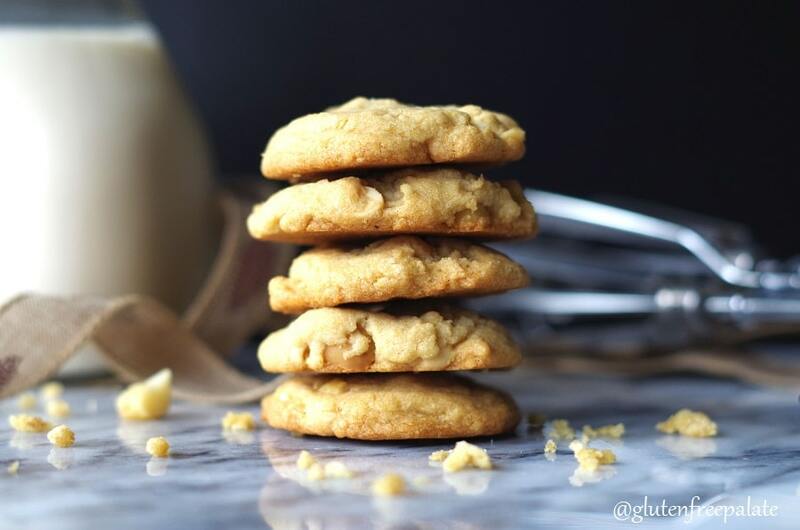 These Gluten-Free White Chocolate Macadamia Cookies are just one of the amazing recipes she shared. 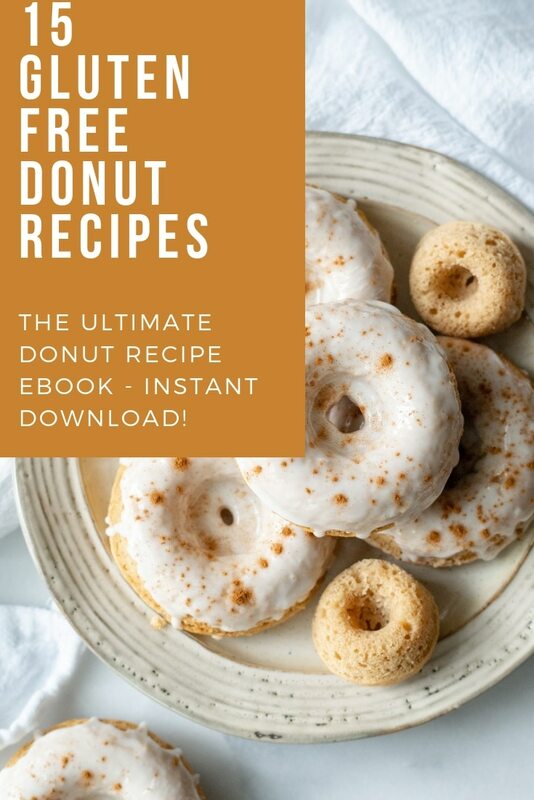 Just double check the ingredients in the recipe as they may not all be gluten-free. Did you make these cookies? Stop back by and let me know what you thought. Crunch, chewy, Gluten-Free White Chocolate Macadamia Cookies are a perfect treat any time of the year. These are the best cookies ice ever made! I skipped the nuts, and I froze the dough for 10 min before baking. Thank you, i will definitely make these again! Thank you so much for stopping back by and letting me know! Looked at multiple recipes due to the craving. Went with this recipe. AMAZING! IMO most gf recipes have a fear of salt and this is constant it seems. I could only fine some Sea salt MN. Being roasted and salted, I used only a little extra salt not the 1/2 tsp. Use it. Rested dough for 30 in the fridge and used van extract. The paste site said it was the same as. These are spectacular! Amazing! And so gourmet it’s beautiful. Thank you so much for this. So glad you liked them! They are one of my favorite cookies. Thank you for taking time to stop by and let me know. What brands of white chocolate chips are gluten free? I use Guittard white chocolate chips. I hope that helps! How many cookies does this yield? Is there just one egg? Its not in the ingredients but it is in the directions. Yes, one egg. It’s listed in the ingredients as the 5th ingredient in the recipe card.